2014 winner of a Genre Fiction award from Library Journal! After a whirlwind romance, Taryn Young is preparing to board a plane at Houston International Airport, bound for a dream honeymoon, when a bomb decimates the terminal. Injured but still alive, she awakens to discover her husband is missing and they’re both considered prime suspects in the attack. Further, the FBI is convinced her husband isn’t who he appears to be. Agent Grayson Hall’s number-one priority is to catch those responsible for the day’s act of terror. All evidence is pointing to Taryn and her new husband. But his instinct tells him her pleas of innocence are genuine. Is her naiveté just for show, or could she truly be another victim of a master scheme, possibly linked to the software she recently developed for her company? With both their lives and reputations on the line, and the media outcry for justice increasing with each passing minute, Taryn and Grayson have no choice but to trust one another . . . and pray they can uncover the truth before they become two more casualties. In this first installment of Christy Award–winning Mills’s Deadly Pursuit trilogy, beautiful but socially awkward Taryn Young marries Francis “Shep” Shepherd after a brief courtship. Acutely aware of the national importance of her software design skills, she is hooked by Shep’s appreciation of her work. But as they board a plane for their honeymoon, a bomb explodes. Shep disappears; airport tapes show him fleeing just before the explosion. FBI agent Vince Bradshaw accuses Taryn of planting the bomb with Shep. But Bradshaw’s partner, Grayson Hall, believes Taryn’s protests of innocence. Hall and Taryn join forces to find the connection between the bombing and the security software she is developing—and to find their respective paths back to God. The murder of Taryn’s best friend Claire and the abduction of Claire’s daughter, Taryn’s godchild, raise the stakes higher. The surprising identities and motives of those villains, and the growing trust between Taryn and Grayson, will keep readers turning pages in this fast-moving, intricately plotted thriller. Taryn Young is a brilliant software developer, but after she allows her heart to fool her head, she finds herself in more trouble than she could have ever imagined. She is now the sole suspect in a major FBI case and must convince the agents in charge that she, too, is a victim. Agent Grayson Hall has been assigned to her case, and despite his professional judgment and his partner’s instincts, he wants to believe Taryn and protect her. The two forge an uneasy alliance as she seeks evidence proving her innocence. The more they learn, the more danger they put themselves in, along with those around them. Mills (Attracted to Fire, 2011) takes readers on an explosive ride. The terror is all the more chilling because it could easily be a headline story on the nightly news, and Mills’ characters spring to life through their fears, strengths, and quirks. 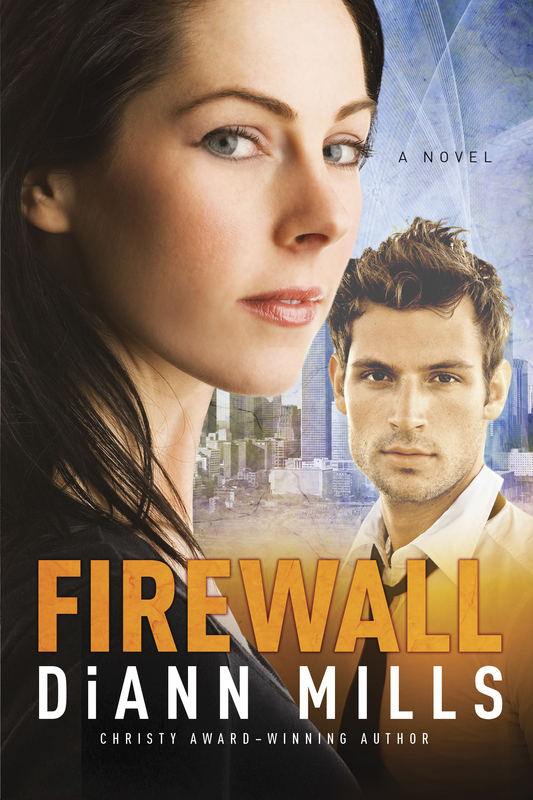 A story as romantic as it is exciting, Firewall will appeal to fans of Dee Henderson’s romantic suspense stories. 4 Stars. Mills once again demonstrates her spectacular writing skills in her latest action-packed work. From the opening sequence that quite literally begins with a resounding bang, the story moves at a fast pace that will keep readers riveted until the climactic end. The cast of characters, including the villains, is diverse and well fleshed-out, particularly given the widespread scope of the story. It’s great to see an intelligent heroine who’s actually able to showcase her smarts. A woman risks her heart and then her life in Firewall (Tyndale House, 416 pages, ISBN 9781414389936) by DiAnn Mills. Genius software developer Taryn Young thinks she finally has everything: a great job, a man who loves her, a brand-new marriage. But disaster strikes before the honeymoon can begin when an airport bombing injures Taryn, and her husband disappears. At the hospital, it’s clear the authorities suspect Taryn might be involved in the death and destruction. FBI Special Agent Grayson Hall’s gut tells him the beautiful woman is truly bewildered by what’s come to pass, but that doesn’t stop him from investigating her and the man she married. Fingers are pointed in several directions, but as the truth comes to light, so does more danger for Taryn and Grayson. When a child is kidnapped, the two must work together to stop evil in its tracks. A skillful blend of suspense, romance and spirituality, this book’s intricate storyline will keep readers guessing. A new bride traveling to Puerto Rico is the prime suspect in the bombing of Houston’s airport terminal, but one FBI agent thinks she might have been set up. With an intricate plot involving domestic terrorism that could have been ripped from the headlines, Mills’s romantic thriller makes for compelling reading. Read DiAnn's Latest Blog Post!